The Basic Agrarian Law (UUPA) No.5/1960 was announced in Indonesia following independence. The law was a legal umbrella, both in law and in practice, for Indonesia to manage natural resources and to ensure the sovereignty of peasants and people as a whole in Indonesia. The law also includes mandates to guarantee and ensure the implementation of agrarian reform in Indonesia. Despite its initial purpose to guarantee land for the people and land to the tillers, in practice the Basic Agrarian Law has been deliberately undermined and distorted. State apparatus has issued partial and sectoral agrarian policy that has eliminated the guarantee to make peasants and people in Indonesia sovereign over their use and management of natural resource. The development paradigm in Indonesia today does not have a clear vision of the reality of people’s economy. First, there is no clear direction or development policy framework, on the contrary development policy is based on free market principles and capital intensive production. This policy results in major opportunities for lucrative transactions for greedy investors. The impact of transactional economic development significantly impacts Indonesian people, especially peasants. Second, land grabs through the hidden agendas of transnational corporations to fulfill the needs of export commodity and extractive industries are threatening the peasants’ source of livelihood. These free market policies are being implemented through projects like REDD and Food Estate. Third, the state continues to refuse to acknowledge the existence of indigenous land, deliberately ignoring both the constitutional rights of indigenous people and the inclusion of this within the Basic Agrarian Law. Fourth, economic development policies create human rights violations with many peasants suffering from criminalization by the state in the name of development and increased investment. 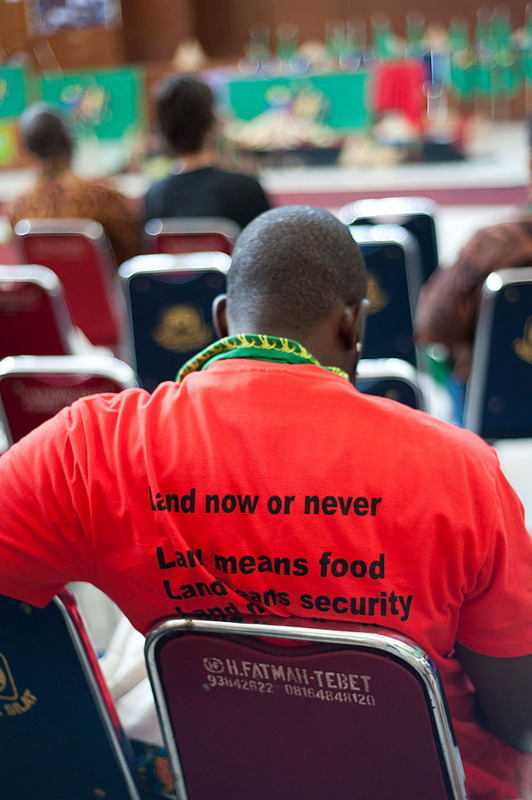 Fifth, the irony of current development policy is shown by the increasing number of poor people, with peasants making up 80% of the beneficiaries of food subsidies in Indonesia according to the Ministry of Agriculture in the opening ceremony of La Via Campesina VIth Conference. Agrarian conflicts between peasants and both state-owned and private companies’ further highlight these problems, with 120 separate reported cases according to SPI data. The cases include 342,360,43 hectares of land being taken from the hands of peasants, 35 peasants enduring criminalization, 18 people killed and 273,888 families expelled. 1. Genuine agrarian reform in line with Basic Agrarian Law 1960 and to maintain Basic Agrarian Law 1960 as an umbrella for the implementation of agrarian reform in order to realize the mandate of Indonesian Constitution 1945. 2. More detailed public policy addressing genuine agrarian reform should be released in the form of government regulation on agrarian reform. 3. Agrarian conflicts resolution by forming a national committee with a strong focus on social justice values. 4. The government of Indonesia should build National Food Institution to implement a national food system that regulates the food value chain, including distribution, food safety, and food aid. The government should also impose tighter food import measures. 5. Reduction of the role of transnational corporations in agriculture and food by halting the ongoing government implemented food estate program. 6. The development of a national industry based on agriculture, fisheries and biodiversity to facilitate possibilities for food sufficiency, creating jobs while reducing dependence on imported food. 7. The mainstreaming of cooperatives, peasants’ economies, and micro, small and medium businesses within the food and agriculture sector. State-owned enterprises (BUMN) should play a bigger role for taking care of basic industries that come from food and agriculture sector. 8. Continuation of Go Organic program 2010 with concepts and the implementation of agroecology principles. 9. To give bigger roles to peasants in Indonesia’s development implementation program by reviewing the Agricultural Minister Regulation No. 273/Kpts/OT.160/4/2007 on the Farmers Institutional Development Guidance. 10. To repeal free import tariffs, especially on food, and to ban Genetically Modified Organisms (GMOs). To build more just and fair global trade in the future replacing the World Trade Organization (WTO) and FTAs, and to impose strict measures in order to avoid speculation on food, agriculture and land. 11. The government of Indonesia to develop a special program to provide food for the poor, mainstreaming healthy food for pregnant and breastfeeding women, widows, and also for girls and children. 12. To fix the database concerning food and agriculture in the National Statistical Agency (BPS), to form the basis of good public policies for peasants and the people in the future. 13. The government of Indonesia to resolve the widespread increase of agrarian conflicts as soon as possible without criminalization of peasants struggle (agrarian cases attached). In solidarity for Indonesian peasants and the people’s sovereignty.